In 1960 Gordon Smith was awarded a Canada Council Senior Fellowship, which enabled him to travel to New York, England and Europe. During this trip Smith was drawn to paintings that focused on colour, mood and light to convey their artistic message, and on his return to Vancouver in 1961, he plunged into a brighter palette. In this early 1960s period, Smith produced a group of works in which biomorphic shapes, placed in a central cluster, float on fields of colour, and Strange Forms is a boldly expressive work from this group. His brushwork is vigorous, resulting in paint surfaces that are textured and rich. Smith's use of colour in these paintings was vivid - and here, cobalt, magenta, hot orange and lime green make a vibratory visual statement. Smith's forms in these works suggest the vegetal, and some even suggest the internal-organ shapes used by Arshile Gorky, whose retrospective Smith viewed in San Francisco in the 1950s. 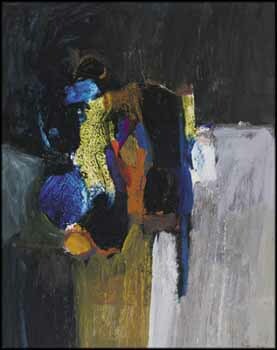 Gorgeous in colour and freely expressive in its use of paint, Strange Forms draws and compels the eye of the viewer.